Beowulf is the longest Old English poem, some 3,200 lines in length, representing a tenth of the 30,000 lines of OE poetry which survive. It relates events set during the European Migration Era (400-600); was probably composed before the death of Bede (735); and the version we have was probably written down around 1000. Setting All the events of Beowulf are set in Denmark and southern Sweden; it doesn’t even mention Britain or England which makes it odd that it is routinely discussed as the first great work in English literature – though having read the Eddas I now appreciate that Germanic culture, language, myths and legends stretched during this period in a continuum from the Black Sea to Iceland. Beowulf was only given its current name in 1805 and was first published in 1815. Manuscript Beowulf survives, like most OE, in just one manuscript, in this case British Library Cotton MS Vitellius, which was damaged in a fire but luckily survived. The manuscript also contains handwritten texts of a homily on St Christopher, the Marvels of the East, the Letter of Alexander to Aristotle and an imperfect copy of another Old English poem, Judith. All five texts concern or mention fabulous beasts so the MS may well have been assembled around this theme. The verse is written out as continuous prose, divided into numbered sections. So the layout of all modern editions into traditional poetic lines, often with clearly marked half line-breaks, the punctuation, commas, full stops and speech marks, are all the work of modern editors. hu ða æþelingas | ellen fremedon. Author Of course no-one knows who the author was or even where it was written: but scholars agree it is the work of a sophisticated and well-educated Christian, maybe even a monk, probably associated with one of the royal courts which flourished in the 700s, either of Wessex or Mercia or Northumbria. Plot In his youth Beowulf the Geat, from south Sweden, sails to the legendary court, Heorot, of King Hrothgar the Dane, and frees it from being terrorised by the monster Grendel who has been attacking and sweeping off warriors to kill and eat for 12 long years. No sooner is Grendel defeated than his mother attacks. Beowulf tracks her back to her lair beneath a lake, there fighting and killing her. He returns in honour and laden with gifts to Geatland and his king, Hygelac. Eventually Hygelac and his son die and Beowulf becomes king of the Geats. 50 years later his own kingdom is threatened by a dragon. Beowulf heroically defeats the dragon but is himself killed; he is burnt on a pagan funeral pyre, buried in a mound by the sea, and it is predicted that his people will now perish. It is not a happy ending. Historical provenance Beowulf is nowhere attested in the historical record. Maybe he is entirely fictitious. But his Geatish lord, Hygelac, was certainly real: he is recorded as dying in a skirmish against the Franks about 520 in Bishop Gregory of Tour’s History of the Franks. So soon after is when Beowulf would take over as king; and fifty years later would date his fight with the dragon and death around 570AD. Network of references If the plot is so simple, how come the poem is so long? Partly because it is enmeshed in scores of references to other Germanic legends of the Migration Era. These were clearly designed to pad, bolster and ennoble the main plot, but are a stumbling block to the modern reader: whereas the contemporary audience would have caught the subtlest reference to these stories, we know next to nothing about these long-lost legends; many are only barely explicable by reference to scattered and obscure references or fragments. An epic should be universal, taking in all of life and representing it in such a way that the general truth of the presentation is universally recognised. Its scope should embrace war and peace, men and gods, life and death in a comprehensive and encyclopedic way. And its presentation should be objective…. One’s consciousness of unity in the Iliad, and in epic generally, springs not from a unity of action but a unity of consciousness, an ethos which arises from a primitive intuition of the cosmic solidarity, organic unity and continuity of life. 1. 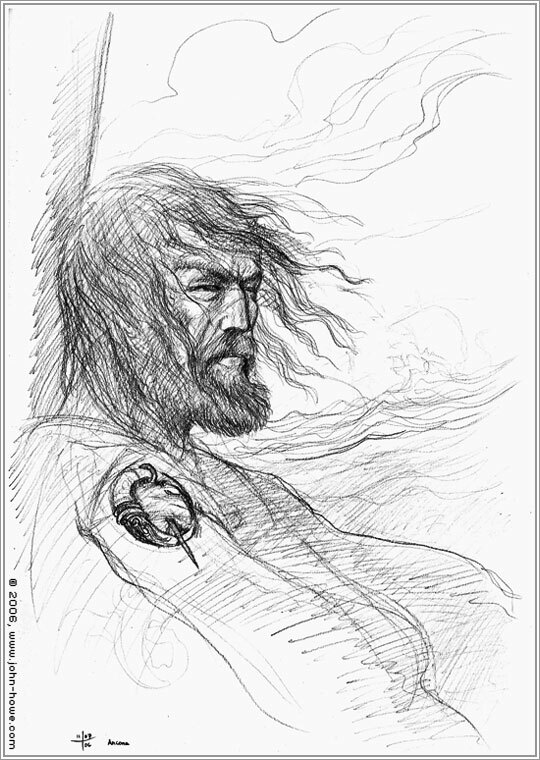 Inclusiveness of scope Beowulf comprehends life and death, man and God, peace and war. It opens with the funeral of one hero, follows the career from young glory to aged defeat of another hero: a lifecycle. The entire life of a people, the Geats, its rise and fall, is described. Peace with its beauty and ceremonies in the hall of Hereot is described, and war and its devastating consequences among the Germanic tribes is continually referred to. Goodness and civilisation at the hall are disrupted by evil incarnated in the monsters. The start of history is captured by the scop or bard, who inaugurates Hereot by singing a poem of God’s Creation of the world – and the end of the history is symbolised by the prophesied extermination of Beowulf’s people after his death. God is seen intervening at key points throughout the poem; but the Devil is alluded to once and his forces, the monsters, drive the plot which is a microcosm of the endless battle of Good against Evil in a fallen universe. “The whole life of the people and of mankind is involved in the struggle of the hero-king against the dragon.” In its way, it is as cosmic in ambition as Paradise Lost. The dignified presentation of death Alexander considers the poem gives weight and due importance to all its characters and especially to their deaths : “Every single one of the numerous individual deaths in the poem is given its full weight and significance… Homer and Tolstoy do not outdo Beowulf in their respect for the gravity and commonness of dying.” Though Alexander admits that the poet does intervene, does comment, does include homilies and morals, thus falling short of the “blithe cosmic impartiality” of Homer. But then who doesn’t? Values “Value are constant: sunlight is good, cold is ominous.” Constant, simple and dignified. Feasting in the firelit hall is good. Being isolated in the cold moor is bad. Fighting alongside your brother warriors is good. Being betrayed by a colleague is bad. Impersonal “In epic, human and non-human actions are felt to be part of a larger impersonal if organic process, the authority of which is not questioned, but accepted and respected. (Critics of Homer speak of the aidos, or respect, felt for the operations of the process. )” Alexander concedes the poet’s Christian comments and interventions do break this impersonality; they intrude sermonising; they prevent Beowulf rising to the heights of Homer. Nothing in western literature does. Already known Unlike most modern narratives, whether novels or plays or movies, in an epic poem the audience knows the story and outcome before the start. This means a) the audience and poet are interested in the treatment not the plot b) the poem is full of flashbacks, recapitulations, anticipations: these amplify the sense of completeness, of pattern, of objectivity and detachment from events. 3. Unity of ethos is related to objectivity. The one enables the other. The poet achieves his objectivity because he is working within an objective worldview. “The stability of the system of epic formulae perpetuates the tribal view in the hallowed tribal words. This system is itself an organism. Each verbal formula is the tribe’s crystallisation of an aspect of experience…” The crystallisation is possible because of the tribe’s shared views. The tribe’s shared views are crystallised in the formulae. This is why the way in which OE alliterative verse tends to separate stock phrases in apposition into stand-alone units, also emphasises the deep, archaic, shared value in these phrases – and smoothing their clunky positioning out into fluent modern English prose completely obliterates not only their poetical, but their ideological impact, which is enormous. The Aeneid issue CS Lewis divided epic into primary epic (made by a sometimes illiterate near-contemporary in the culture he is describing – Homer) and secondary epic (a conscious recreation of a vanished world by a highly literate author from another culture – Virgil). Beowulf is nearer the second category because, as all scholars acknowledge, although it is written about preliterate pagan Germanic society in pagan Germanic poetry using pagan Germanic formulae, it was actually composed by a highly literate Christian, possibly even a Christian Anglian monk, just about as far removed from the world of feasting, fighting German pagans as he could be. He is in love with the pagan world and its culture; presumably so is his audience or there would have been little point composing the poem; but he is decisively separated from it by his Christian faith. 4. A significant action At its core Beowulf is a folk story or, deeper, a myth. A hero fights monsters three times: the first two times he conquers; the third time he is old and the monster kills him. It is a profound emblem of the life of man, overcoming challenge after challenge, but unable to avoid, ultimately, his own mortality. If, at a deep, mythical level, the story is about Man confronting his own Mortality, Alexander suggests that at a higher level the “significant action” or actions emphasise the importance of loyalty to the chieftain as the fundamental tie in heroic society; Beowulf dies on a mythic level because the dragon kills him, but on a social level because his 12 thanes abandon him; at his moment of need the bonds of allegiance break down; and that is symbolic of the fragility and vulnerability of heroic society as a whole. It has the same elegiac feel as the collapse of the Order of the Round Table. Sure, it’s attacked by external enemies; but it is its internal weakness that condemns it. And here again the “Aeneid effect” kicks in – the poem laments the passing of one warband, one people, the Geats – but the Christian poet, at a higher level, laments the passing of the entire pagan way of life. It is a double elegy. It is made up of dynamic, vigorous, virile verse which, at every moment, is haunted by the transitoriness of human power and life. It is wonderful. John Howe The illustrator John Howe has created a wonderful series of illustrations of Beowulf on his website. Enjoy and marvel. Energy is eternal delight as William Blake said. Both Tolkien and Alexander emphasise the power and forcefulness and energy of the verse which, of course, reinforce the subject matter of the poem which is, ultimately, the hero’s virility. Beowulf has “a hero’s delight in his own prowess and a hero’s magnanimity to lesser men”. His virility burns bright in his youth; then diminishes and is conquered in old age, by death. It is no shame. We all share the same destiny. Beowulf is revered for his defiance, his unwillingness to go gentle into that good night, for his prowess. All quotes copyright © Michael Alexander 1973, reproduced with kind permission of the author. Old English, or Anglo-Saxon, is the language spoken by the Germanic settlers in England from their arrival in the 450s until a few generations after the Norman Conquest. Scholars divide OE into prehistoric OE (before anything was written down); Early OE 650-900; Late OE – after the Vikings/Danes invaded north and eastern England. There is a theory that interacting with the Danes in the Danelaw ie the East of the country which they settled, hurried the abandonment of the inflections which made OE hard to learn, speeding the transition to early Middle English. The Danes, the Normans and the spread of Latin learning, all did for OE. Some 80% of OE words didn’t survive into Middle English, let alone modern English. Compressed As with the poems in the Elder Edda, the alliterative form of Anglo-Saxon verse, and the inflectional nature of the language, tend to make the poetry compressed, very compressed. Pronouns and connective words aren’t necessary. A lot is conveyed by two words. The modern English translation always takes more words to say the same thing. Apposition The division of the already short 4-beat line into two 2-beat parts combined with the requirement for every line to alliterate, makes for continual use of apposition ie small alliterative phrases or units are deployed to fit the alliteration more than the flow of the sense. Separation As in Latin poetry phrases can be widely separated since the inflections – not the word order – explain the grammatical relationship between them; short phrases often refer to people or actions a few lines earlier, rearranged to make the alliteration. This sense of dislocation and apposition adds to the special character of the poetry. Stock phrases It is assumed the poetry originated in oral form, composed by skilled poets or skopas who used stock phrases or readymade formulas to elaborate on the spot equally well-known stories and legends. A number of stock half-lines occur in more than one poem; a few occur more than once in the same poem. Laconic The affect of all these factors is to make the verse very clipped, abbreviated and laconic. The brevity tends to understatement; a lot is implied. There is a continual sense of very masculine understatement. Litotes This tendency is made explicit in the use of litotes, a Greek term for a figure of speech in which understatement is employed for rhetorical effect, usually through double negatives eg rather than saying that something is attractive (or even very attractive), you say it is “not unattractive”. Many of the final words in each line are infinitives or other forms which take a weak final syllable. OE poetry is full of weak, feminine endings. This produces a kind of dying fall to almost every phrase – eg “…folc and foldan. | Feallan sceolon…” giving the poems as a whole, a particular rolling music. I’ve set out to try and avoid these losses. I am trying to create a version of mongrel English which stays as close as possible to the original in every respect – words and word forms, apposition and alliteration, avoiding all Latinate or French words, using archaic forms and even inventing new words to bridge the gap between then and now, the damaged often obscure source text, and the clear fluent logic demanded by our shiny white screens. I am trying to make them readable but to keep as many of the qualities identified above as possible. the lands for men, the Lord almighty. eternal Lord | ordered beginning. fields for folk, | father almighty. For a really thorough discussion of the complex manuscript history of the hymn, see Reading Cædmon’s Hymn with Someone Else’s Glosses by Kevin Kiernan. Composition The poem was probably composed a few years after the battle and therefore towards the end of the Anglo-Saxon period (which lasted from the first arrivals in the 450s until the Normans conquered in 1066), many centuries after the kingdoms of England had converted to Christianity (a process started in the 600s). Among other things it shows how the pagan values of heroic pagan society had lived on into the Christian age. The poem is 328 lines long but is incomplete. The original manuscript was burnt in a fire in the 1730s but had – fortunately – been transcribed. The opening and ending are missing and there is no title; the one we use is a convention. So is all the punctuation, all commas, full stops and speech marks. Pronunciation ð and þ are used interchangeably for ‘th’ as in thou and then. A g at the start of a word is pronounced as y. For more on Old English pronunciation you can watch a YouTube video or read a scholarly introduction. “Gehyrst þu, sælida, | hwæt þis folc segeð? þa heregeatu | þe eow æt hilde ne deah. on urne eard | in becomon. “Hearest thou, sailor | what this folk sayeth? War equipment | that to-you in battle will not profit. In our earth | in be comen. ealra þæra wynna | þe ic on worulde gebad. For all the joys | that I on world abode.